Loadfiles are the cornerstone of getting data in, and out of review platforms. They come in all shapes and sizes, and often, litigation support teams and platform administrators want to be able to perform checks, or make amendments or changes to them before loading them into the review tools, or exchanging them with another party. Our team was regularly having to convert loadfiles from DAT to CSV in order to open them in applications such as Microsoft Excel to check and apply any modifications to the loadfiles. Sometimes, Loadfile delimiters could appear within the columns which could cause issues, or the column data could be too long. RTK.Loadfile complies with the CSV specification and effectively handles escaping of delimiter characters. 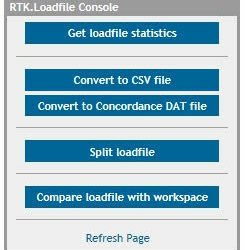 RTK.Loadfile has been tested on Relativity versions 8.0 and higher and is installed using Relativity's Application Deployment System.